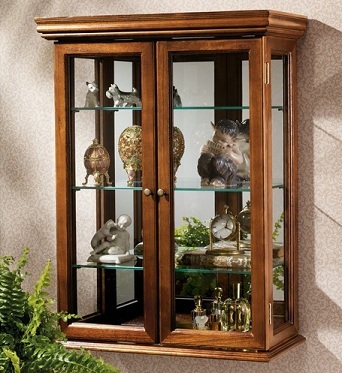 A wall curio cabinet is an excellent item in which to showcase your finest collectables. They mostly all consist of a glass cabinet with wood or metal frameworks and are used primarily to display a collection of items of a similar theme or subject matter. This Tuscan style hardwood wall curio cabinet is designed for placement on a wall in a living room, dining or even hallway. Its mirrored back reflects the contents within as well as the room at large. The Country Tuscan curio from ‘Design Toscano’ features glass panelled doors and sides for clear viewing of the items placed inside. The mirrors and glass doors make this cabinet ideal for large or small rooms and does not in any way bring a visual heaviness to the interior. Three glass shelves enhance the lightness of the cabinet even further. It’s perfect for showcasing a collection of china, porcelain sculptures, statuettes, trophies, and similar objects. One thing is for sure, maximum light and viewing pleasure will be shed upon the contents inside. You can buy it from here: Country Tuscan Style Hardwood Wall Curio Cabinet. Note: The glass shelves are removable.